Otitis media (OM) is very common in children worldwide, and in developing countries, it is the main preventable cause of hearing loss, where it accounts for up to 90% of hearing loss in children. The prevalence of chronic OM varies in different countries and ethnic races, but the greatest burden is exclusive to countries in South East Asia, Western Pacific regions and Africa. The prevalence of chronic OM in Nigeria is 2-4%, ranking among the highest seen in Sub-Saharan Africa. , There are 2.163 million disability-adjusted life years lost to OM,  94% of which comes from Sub-Saharan Africa. In the United States, the estimated treatment costs of OM is $3.8 billion annually,  but scarcity of data in developing countries on health costs burden of OM attempts to mask the severity of the disease. Apart from the costs associated with OM, its association with hearing impairment in developing countries suggests that efforts at curbing the disease should be a priority. Risk factors (RFs) of OM include recurrent upper respiratory tract infections, , tobacco smoke,  bottle feeding,  short duration of breast feeding,  day care attendance,  family history,  male gender and low socioeconomic status (SES). ,,, While some of these RFs are inalterable, many of them could be modified by appropriate lifestyle changes. This presents a huge potential in the control of OM and its associated sequel that can be tapped by such lifestyle changes. This study aimed to determine the knowledge of caregivers on the RFs associated with OM and their willingness to modify their lifestyle to reduce the risk of OM in their children. We also sought to examine the impact of SES on the knowledge level and willingness in lifestyle alteration. This is a prospective study to assess the knowledge base of caregivers of young children about RFs for OM. This was done using a modified Ear Infection Survey questionnaire. The caregivers/mothers of young children presenting to the ENT outpatient clinic and the immunization clinic were interviewed to determine their knowledge of RFs for OM using the survey instrument. Apart from assessing the general knowledge of the mothers on OM, the instrument was also designed to determine whether the mothers were aware of the RFs that were unchangeable and those that could be modified. It also aimed to determine their willingness to undergo lifestyle modifications to reduce the risk of OM in their children. The instrument also collected data to determine the socioeconomic class of the respondents. The caregivers/mothers were recruited from both clinics sequentially irrespective of the complaint the child may present with to the hospital. Classification into socioeconomic classes was done using level of educational attainment and occupation as indicators. A previous study in Nigeria has demonstrated that these indicators can be used to delineate socioeconomic classes. The participants were grouped into five classes, with class 1 being the highest and class 5 being the lowest. Classes' 1-3 was grouped as high SES and classes 4-5 as low SES. Results of the categorical variables were presented in frequency tables, correlations were sought with Chi-square test between the SES and the following: RFs of OM, knowledge of RFs and willingness to modify behavior. Student's t-test was used to assess the equality of means and Levene's test for equality of variances. One hundred caregivers completed the questionnaires; they were principally females (four males), with ages ranging from 17 to 49 years. The study site is in Southwest Nigeria, where the predominant tribe is Yoruba. This is reflected in the tribal distribution of the caregivers surveyed [Table 1]. Majority of the caregivers surveyed were in the higher socioeconomic strata; SES I-III made up a cumulative proportion of 81% [Table 2]. Middle ear ventilation tubes are not popular in Nigeria, and this is reflected in the answers given by the caregivers. None of the children represented has ever had ventilation tubes. There are significant differences among low and high SES in day care attendance, siblings with OM and parents with history of OM. 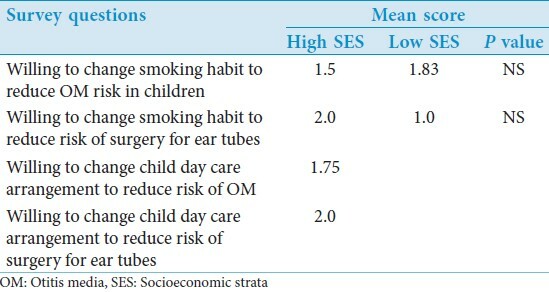 Only children from the high SES attend a day care; household smokers are also higher in the high SES group; apart from these, every other RF is higher among the lower SES [Table 3]. The answers from the respondents suggest that people from the high SES have better knowledge of all the RFs of OM included in the questionnaire than people from low SES. The difference in knowledge of household smokers and breast feeding as RFs is significantly different between the two groups [Table 4]. A within-group analysis showed that knowledge of the protective effect of breastfeeding is greatest within the high SES group, followed by a parental history of OM and day care attendance. The low SES generally displayed a poor knowledge of RFs associated with OM. None of the respondents in the low SES group makes use of day care services, indicating that there is no behavior modification in that aspect for them. There is no significant difference between the two groups in their willingness to modify behavior to reduce cigarette smoke exposure to children, although it appears that the low SES is strongly averse to surgical procedures [Table 5]. Our study population is overwhelming female; this may be attributed to our mode of recruitment from within hospital visitors. In many African countries, mothers and female caregivers are more likely to present with sick children to the hospital. We also recruited from immunization clinics, which are likely to be dominated by female caregivers. The tribal pattern seen in our study is a reflection of the location of our study center; although Ibadan is a cosmopolitan city, the southwestern part of the country is mainly populated by the Yoruba tribe. However, the accepted opinion is that cultural differences between the tribes will not significantly impact the quality of answers seen; rather, the SES. Poverty might be the single largest influence on causation of diseases. It is also directly linked to level of educational attainment; this may have prompted the World Health Organization to promote the education of females since it has been shown that child survival is directly related to educational status of their mothers. , Apart from RFs associated with affluence, the low SES unsurprisingly had the greater incidence of RFs of OM. Low SES itself is a RF, and it is closely associated with RFs such as overcrowding. Different studies that have explored the relationship between SES and OM have suggested that there is greater prevalence of OM in low SES. , Poverty is a vicious circle, and this may explain the recurrence of OM seen in parents in the offspring as well. 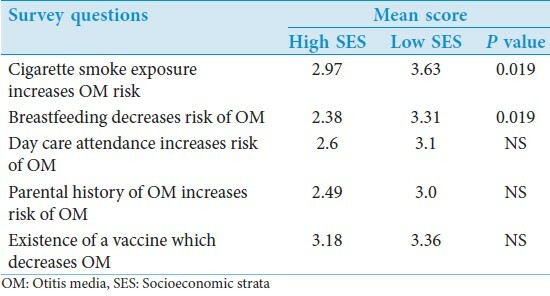 Other factors may be responsible for greater incidence of OM in the low SES. This may include exposure to smoke from biomass and other sources, lack of access to adequate healthcare and drugs. Malnutrition, which is common in the low SES, has been associated with impaired immunity;  moreover, impaired immunity may predispose to the development of OM. This may be one of the mechanisms by which low SES is related with OM. Cigarette smoking appears to be related to affluence in this dataset. This however may not be truly reflective of the larger society. Attendance in day care usually means additional expenditure for the household, which may explain why none of the children of the participants in the low SES group attends day care. The overcrowding usually seen in day care and high prevalence of upper respiratory tract infections among children in day care may contribute to OM. The high SES group is better educated and is more likely to make inquiry from health personnel about the nature of diseases and preventive measures. Nonetheless, only 26% of the caregivers surveyed reported that they have been educated by health personnel on the risks of ear infection. It has been recommended that parents be counseled by health workers on the choice of day care arrangements. Additional suggestions to emphasize the benefits of small day care settings in reducing the risk of OM over a large day care during counseling have been made, especially in the presence of RFs, such as exposure to second hand cigarette smoke or the presence of OM in a sibling. This counseling should be disseminated at all levels of healthcare access points to ensure that both low SES and high SES individuals benefit from the advice. Several independent authors have identified exposure to wood smoke as a RF in OM. ,, More children from the low SES group may be predisposed to indoor wood smoke; however, adoption of newer wood stoves that has considerable less emission of pollutants , than traditional open stoves may mitigate the risk associated with wood smoke. There is currently no available data on the impact of these new stoves on the risk of developing OM, but it is necessary to evaluate the impact of these stoves on middle ear infection, especially in developing nations. Myringotomy tube insertion is not commonly done in Nigeria; this may be due to the structure of the healthcare system in the country, where other allied health workers are usually the first point of contact for health care seekers. Before patients are seen by the specialist, most cases of OM are already chronic, with large perforations in the TM obliterating the need for grommet insertion; however, other forms of surgical treatment for chronic ear disease are routinely done. The affirmative willingness of caregivers, especially those from the low SES groups, to modify behavior in order to avoid surgery indicate issues that should be emphasized in the design of lifestyle modification educational programs for caregivers. Since the questions on lifestyle modification were directed only at caregivers whose children were exposed to risk, it clearly demonstrates the potential that can be exploited in behavioral modification. The limitation of the study is the site of recruitment of participants; being clinics in a referral hospital setting, it is likely that the majority of clients will be educated city dwellers and fall into the high-income group. Conducting the study in primary care centers located in rural areas may attract more low-income participants. Knowledge of modifiable RFs of OM increases with the SES of the caregiver; this supports the argument that improvement of the economic base of households impacts significantly on the health outcomes of individuals in the households. Therefore, healthcare programs in developing countries must be tied to economic empowerment programs to achieve the desired outcomes. Additional training and encouragement of health care workers at all levels is required to disseminate information to caregivers on RFs of OM. Utilizing the knowledge that caregivers are willing to undergo behavioral modifications in educational programs will be beneficial in reducing the prevalence of OM in young children. 1. World Health Organisation-Child and Adolescent Health and Development PoBaD. Chronic suppurative otitis media Burden of Illness and Management Options. Geneva, Switzerland: World Health Organization; 2004. 2. Amusa YB, Ijadunola IK, Onayade OO. Epidemiology of otitis media in a local tropical African population. West Afr J Med 2005;24:227-30. 3. Organization WH. Primary ear and hearing care training resource. Advanced level. Geneva 27, Switzerland: WHO Press; 2006. 4. Gates GA. Cost-effectiveness considerations in otitis media treatment. Otolaryngol Head Neck Surg 1996;114:525-30. 5. Aniansson G, Alm B, Andersson B, Håkansson A, Larsson P, Nylén O, et al. A prospective cohort study on breast-feeding and otitis media in Swedish infants. Pediatr Infect Dis J 1994;13:183-8. 6. Daly KA, Brown JE, Lindgren BR, Meland MH, Le CT, Giebink GS. Epidemiology of otitis media onset by six months of age. Pediatrics 1999;103:1158-66. 7. Adair-Bischoff CE, Sauve RS. Environmental tobacco smoke in middle ear disease in preschool age children. Arch Pediatr Adolesc Med 1998;152:127-33. 8. Wintermeyer SM, Nahata M. Chronic suppurative otitis media. Ann Pharmacother 1994;28:1089-99. 9. Teele DW, Klein JO, Rosner B. Epidemiology of otitis media during the first seven years of life in children in greater Boston: A prospective cohort study. J Infect Dis 1989;160:83-94. 10. Jahn AF. Chronic otitis media: Diagnosis and treatment. Med Clin North Am 1991;75:1277-91. 11. Fliss DM, Shoham I, Leiberman A, Dagan R. Chronic suppurative otitis media without cholesteatoma in children in Southern Israel: Incidence and risk factors. Pediatr Infect Dis J 1991;10:895-9. 12. Lasisi AO, Olaniyan FA, Muibi SA, Azeez IA, Abdulwasiu KG, Lasisi TJ, et al. Clinical and demographic risk factors associated with chronic suppurative otitis media. Int J Pediatr Otorhinolaryngol 2007;71:1549-54. 13. Kerschner JE, Lindstrom DR, Pomeranz A, Rohloff R. Comparison of caregiver otitis media risk factor knowledge in suburban and urban primary care environments. Int J Pediatr Otorhinolaryngol 2005;69:49-56. 14. Oyedeji GA. Socio-economicand cultural background of hospitalised children in ilesha. Niger J Paediatr 1985;12:111-7. 15. WHO Expert Committee on Comprehensive School Health Education and Promotion. Promoting Health Through Schools. Geneva, Switzerland: World Health Organisation; 1997. 16. Das Gupta M. Death Clustering, mother's education and the determinants of child mortality in rural Punjab. Popul Stud 1990;44:489-505. 17. Paradise JL, Rockette HL, Colborn DK, Bernard BS, Smith CG, Kurs-Lasky M, et al. Otitis media in 2253 Pittsburgh-area infants: Prevalence and risk factors during the first two years of life. Pediatrics 1997;99:318-33. 18. Ah-Tye C, Paradise JL, Colborn DK. Otorrhea in young children after tympanostomy-tube placement for persistent middle-ear effusion: Prevalence, incidence and duration. Pediatrics 2001;107:1251-8. 19. Chandra RK. Nutrition and the immune system from birth to old age. Eur J Clin Nutr 2002;56:S73-6. 20. Casselbrant ML, Mandel EM. Genetic susceptibility to otitis media. Curr Opin Allergy Clin Immunol 2005;5:1-4. 21. Green LW, Kreuter MW. Health Promotion Planning. An Educational and Environmental Approach. 2 nd ed. Mountain View, CA: Mayfield Publishing; 1991. 22. Srikanth S, Isaac R, Rebekah G, Rupa V. Knowledge, attitudes and practices with respect to risk factors for otitis media in a rural South Indian community. Int J Pediatr Otorhinolaryngol 2009;73:1394-8. 23. American Academy of Pediatrics Committee on Early Childhood, Adoption and Dependent Care. The pediatricians role in promoting the health of patients in early childhood education and/or child care programs. Pediatrics; 1993;92:489-92. 24. Daly KA, Selvius RE, Lindgren B. Knowledge and Attitudes About Otitis Media Risk: Implications for Prevention. Pediatrics 1997;100:931-6. 25. Daly KA. Definition and epidemiology of otitis media with effusion. In: Roberts JE, Wallace IF, Henderson FW, editors. Otitis media in young children. Medical, developmental and educational considerations Baltimore, MD: P. H. Brookes Publishing; 1997. p. 3-41. 26. Frankowski BL, Weaver SO, Secker-Walker RH. Advising parents to stop smoking: Pediatricians' and parents' attitudes. Pediatrics 1993;91:296-300. 27. da Costa JL, Navarro A, Neves JB, Martin M. Household wood and charcoal smoke increases risk of otitis media in childhood in Maputo. Int J Epidemiol 2004;33:573-8. 28. Noonan CW, Ward TJ, Navidi W, Sheppard L. A rural community intervention targeting biomass combustion sources: Effects on air quality and reporting of children's respiratory outcomes. Occup Environ Med; 2012;69:354-60. 29. Li Z, Sjödin A, Romanoff LC, Horton K, Fitzgerald CL, Eppler A, et al. Evaluation of exposure reduction to indoor air pollution in stove intervention projects in Peru by urinary biomonitoring of polycyclic aromatic hydrocarbon metabolites. Environ Int 2011;37:1157-63.